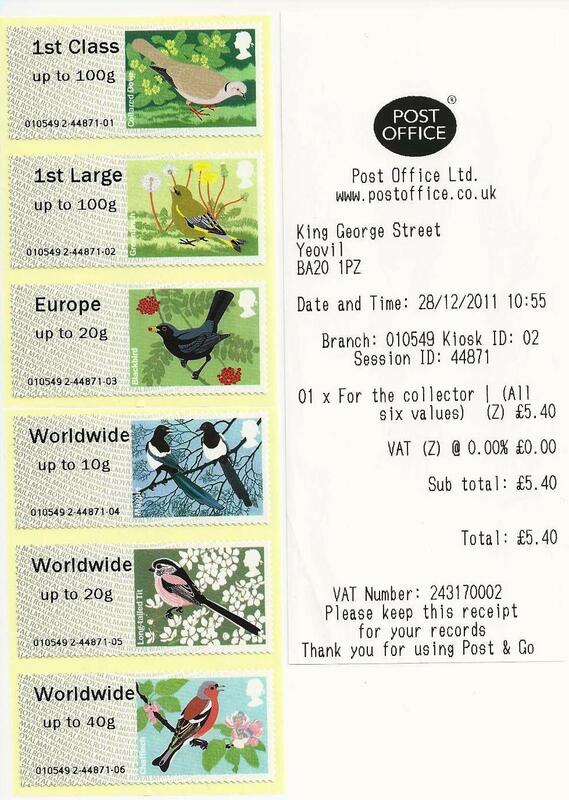 How did Birds 2 Faststamps get to Yeovil Post Office ? As reported here, the upgrade to version 2 of the Post and Go machines has produced 40g versions of the Birds 4, Birds 3 and even Birds 2 Faststamps. Now we've evidence that Birds 2 was being sold at Yeovil just after before* and after Christmas - and that office wasn't even on the Birds 2 original list. So how did this arise? Are there still stocks at Swindon awaiting distribution? * We've been told of Yeovil sales on 23 December. Thanks to Roy for this report! Harrogate V2 40g Birds 2 reported. We've had rumours for a while but nothing substantial. Any news of location? Email me if you don't want to put it here. No location - just a 'grapevine' rumour - likely to be correct...when/if I hear more, will share. Maybe someone else can substantiate?